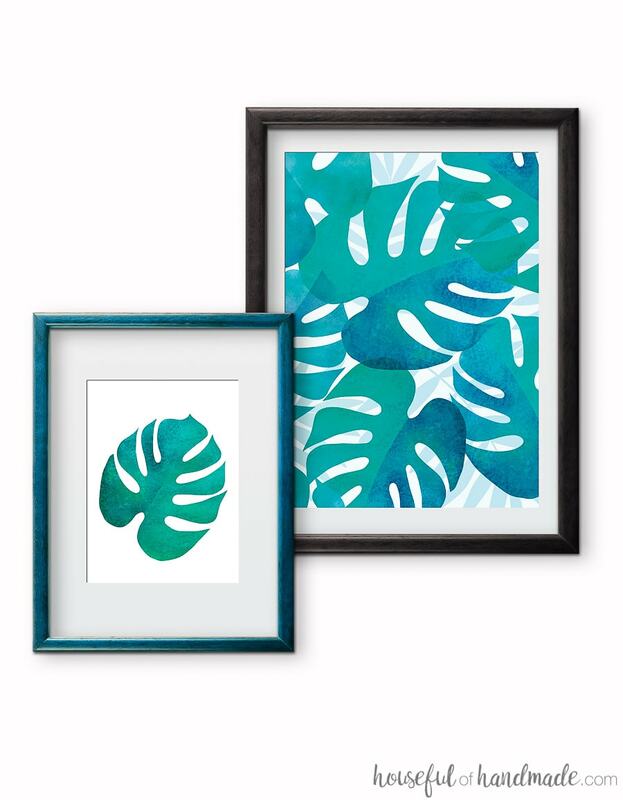 These free printable tropical leaf prints are the perfect way to add island decor to any space. The four different variations of your favorite palm leaf make for instant summer decorating ideas. Summer decorating means bringing a little bit of island life to our mountain home. 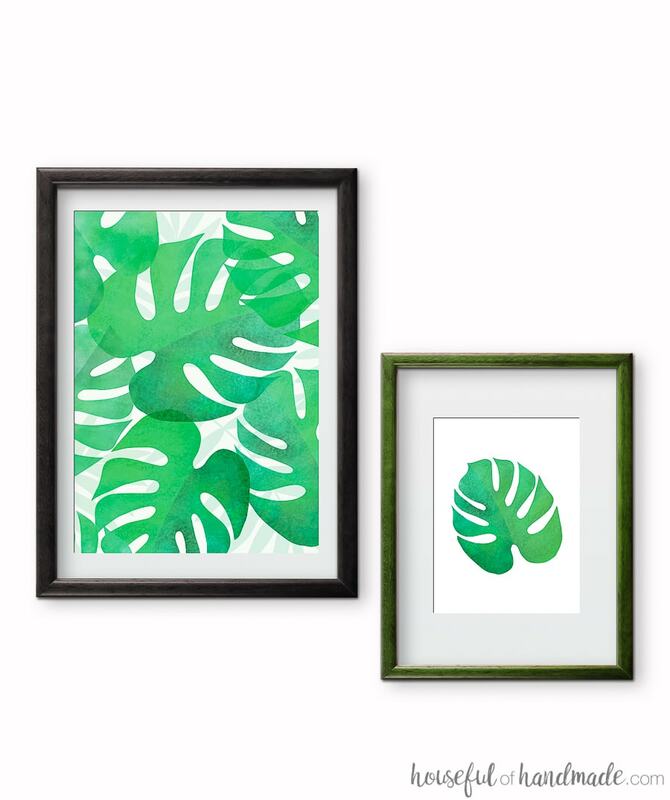 These free printable leaf prints are the easiest way to add summer decor on a budget. 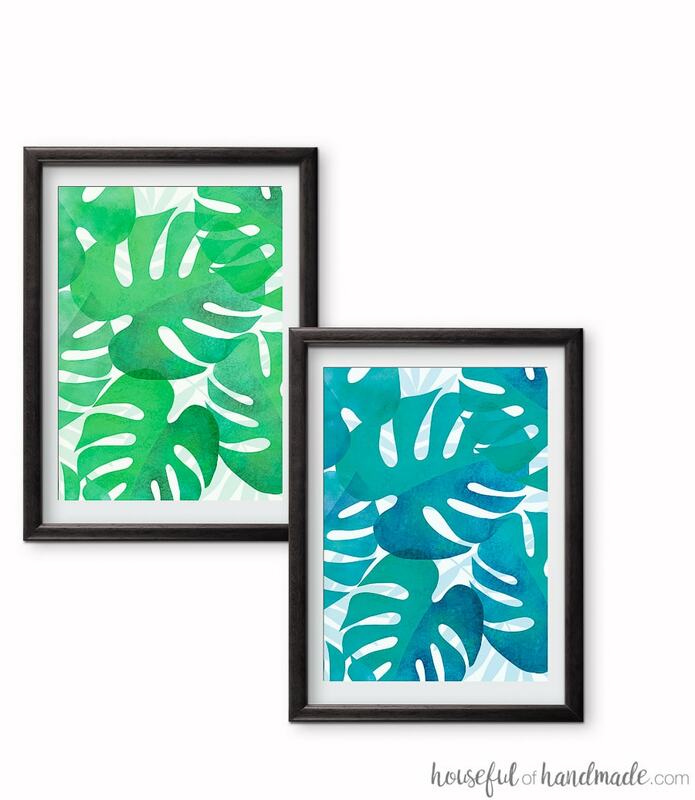 The bright green and blue palm leaf art is perfect for adding a bit of boho tropical decor to any home. Download the 4 different designs today! Now that summer is officially here, I am ready to add summer decor to our home. I know, usually you are suppose to decorate before the season starts, but I am slow this year. I think I still am recovering from a kitchen remodel hangover (that’s a thing right?). But it’s better late than never so now let the summer decorating begin! Usually for summer I decorate in a coastal or nautical theme. The beachy colors and decor blend nicely with our modern farmhouse and give the entire house a vacation feel. But this year I am loving all things tropical! It might be because I absolutely love the tropical vibe of our outdoor dining and kitchen area. It might be because there are so many awesome tropical decor pieces around now. Whatever it is, I think this year we are going tropical for our summer decor. 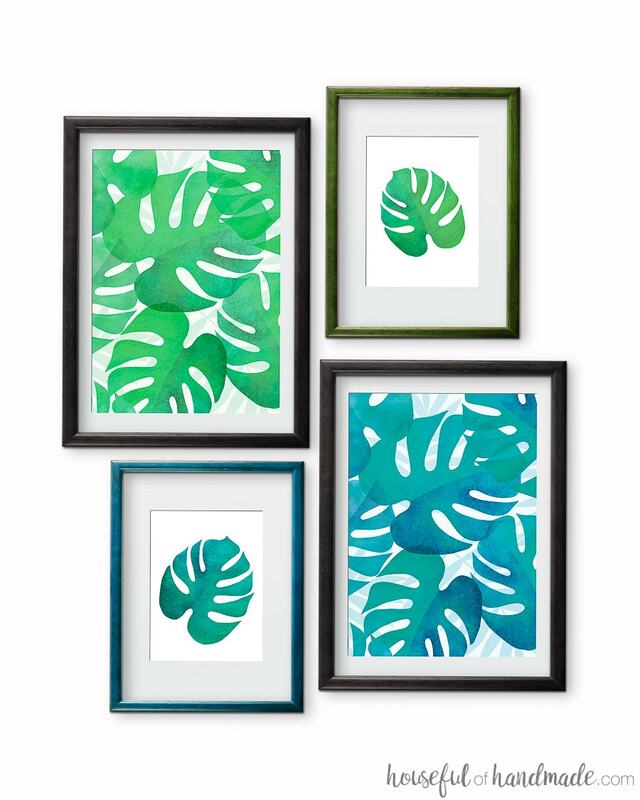 To start the decorating, I knew I needed to turn the June digital backgrounds into free printable tropical leaf prints for our living room. I love how the watercolor inspired palm leaf pattern turned out and knew I wanted to use it again. Turning it into palm leaf art was the perfect solution to use it and add a tropical vibe to the house. And since I love to mix and match different prints to make a big statement. I decided we needed more than just one tropical leaf print. 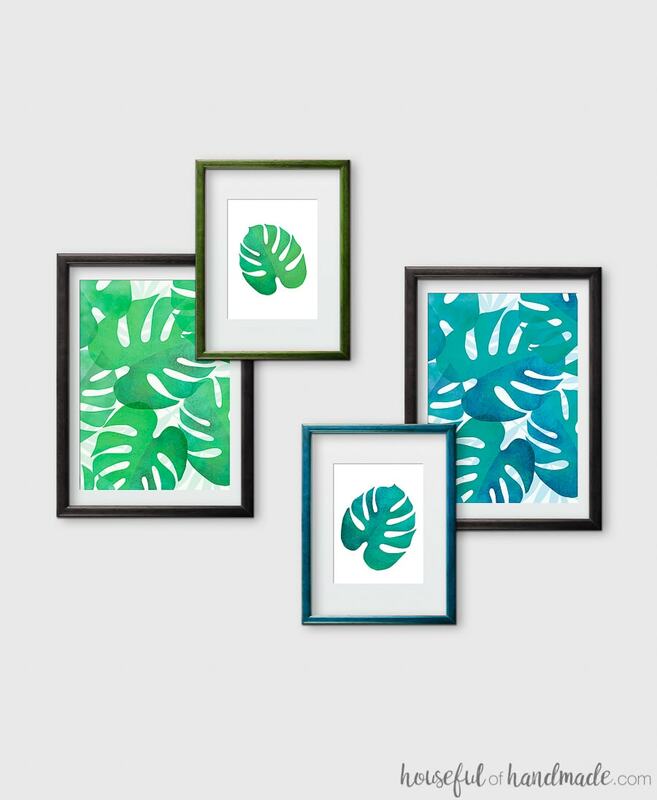 So I created a blue and green palm tree pattern and turned them into printable tropical art prints. 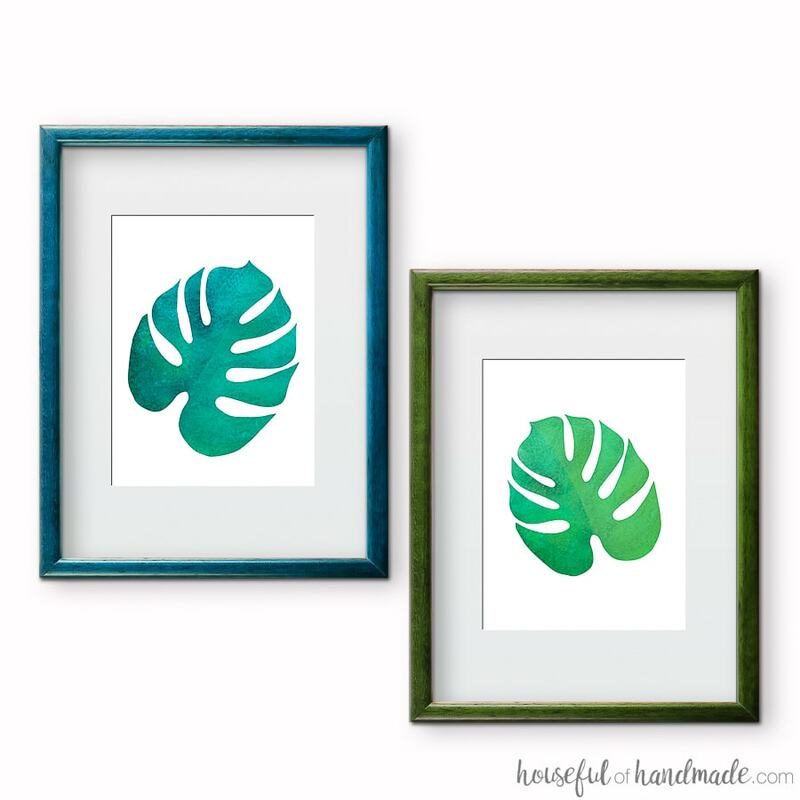 Then I also made a palm leaf print in each color. Now you can mix and match all the fun prints to make a statement. Or just grab your favorite for a little tropical goodness wherever you need it. Even though I have not added the tropical leaf prints to our living room yet (but the summer living room tour will be coming soon, I promise), I wanted to share them with you. So in case you still haven’t decorated for summer (no judgement here) or just want to add a bit of a tropical vibe to your home, I have you covered. 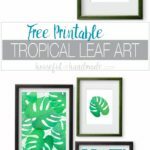 I am sharing the 4 free printable tropical leaf prints in my subscriber library. Click here to subscribe to my weekly newsletter and gain access to all the freebies. If you already have your password, click here to download them. And stay tuned for lots more tropical fun for summer! I can’t log in I lost my password. ???? I put the password in the bottom of each week’s newsletter (just in case you forget). Let me know if you cannot find it! Thank you! I totally missed it. ???? have tried to get in to get the leaves but will not let me. Keeps bringing up the sign-in page even tho I have inserted the password many times. Would love to have the leaves. The password is case sensitive. Can you double check it? I also recommend copying and pasting it to make sure its spelled correctly. Whoops! That was my fault, I forgot to mark the files as public so you can access them. They are fixed now Judi! Please try again and enjoy!